Translational Immunotherapy of Brain Tumors gives researchers and practitioners an up-to-date and comprehensive overview of the field. 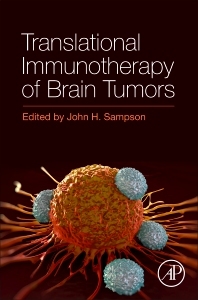 Chapters include adoptive immunotherapy, immunosuppression, CAR therapy of brain tumors, and dendritic cell therapy for brain tumors. Very few agents have been shown to be efficacious in the treatment of malignant gliomas. Recently, there have been a number of studies demonstrating the potential success of immunotherapy for brain tumors. Immunotherapeutics are becoming the most frequent drugs to be used in cancer therapy. These new breakthroughs, now approved by the FDA, are a part of multiple phase III international trials and ongoing research in malignant glioma, meaning that the information in this cutting-edge book will be of great importance to practitioners and researchers alike. Dr. Sampson is the Robert H. and Gloria Wilkins Distinguished Professor of Neurosurgery and Chair of the Department of Neurosurgery for the Duke University Medical Center. He holds a leadership role in the Duke Cancer Institute’s Neuro-Oncology Program and is a recognized leader in the surgical and experimental treatment of brain tumors with a focus on immunotherapy and drug delivery. He has authored more than 220 peer-reviewed publications in this field and serves on the Editorial Boards of the all the major journals in the field. Dr. Sampson has received special training in the surgical resection of very complex brain tumors. In addition, he has special training in the design and conduct of clinical trials. He did his research training under the internationally renowned scientist, Darell D. Bigner, and Nobel Laureate, Gertrude Elion. He currently focuses his clinical practice on treating patients with both benign and malignant brain tumors and divides his time between his clinical practice and an active research laboratory investigating new modalities of direct brain tumor infusion and immunotherapy. Dr. Sampson is internationally recognized in the field of neurosurgery and has received a number of national and international awards and grants in recognition of his expertise in neuro-oncology and especially in the area of immunotherapy for brain tumors. He developed a vaccine against a common mutation in brain tumors that was given Breakthrough Therapy Designation by the FDA after it was shown to extend survival in patients with the most malignant form of brain cancer. His work on another vaccine was also recently published in the journal Nature. His work has been highlighted on the CBS Evening News, 60 Minutes, The Wall Street Journal, and The Diane Rehm Show.